The smallest wild cat in the world, Rusty Spotted Cat is also one of the most playful. A resident of Indian Subcontinent, it is believed to be a miniature version of the Leopard Cat. Weighing between two to three pounds, it is around two feet in length including tail. Females of the species are particularly small. Prionailurus Rubiginosus, the Rusty Spotted Cat has a grayish coat with rusty red colored spots all over its body, coalescing to form stripes on head. Fur is soft and short. Under surface is white and often spotted as well. Face is marked by dark and white stripes that run across the inner aspect of eyes. Eyes appear large in contrast to the small rounded head. Ears are short and oval in shape. Legs are tiny and tail is relatively thick, possibly aiding the cat in moving along trees. An arboreal and nocturnal feline, the Rusty Spotted Cat is known to prey upon small animals including rodents, frogs, reptiles, insects and small birds. The reclusive felid spends most of the day resting in dense cover and comes out at night to hunt. An opportunistic predator, it is known to take domestic poultry, bringing itself in conflict with the locals at times. The cat is very friendly and fun loving though, often being adopted as a pet by some. 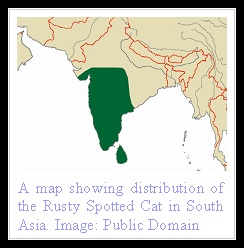 A resident of India and Sri Lanka, the Rusty Spotted Cat is divided into two subspecies on the basis of this geographical distribution. The Sri Lankan subspecies is brighter in coloration and lives at high altitudes in comparison to the Indian variant that prefers to stay in plains. A solitary feline, the Rusty Spotted Cat comes into estrus in spring. Usually one kitten is born after a pregnancy lasting nearly ten weeks. The babies lack the coloration of adults. Longevity and age of maturation is unknown owing to insufficient scientific research into the lifestyle of this elusive cat. 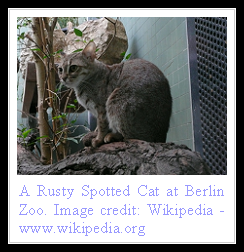 The rare Rusty Spotted Cat faces several risks in the wild that threaten it with extinction. Faced with loss of habitat and hunting pressures, the beautiful cat is also trapped and consumed as food in some parts of its range, making its current conservation status Vulnerable. I like the Rusty Spotted Cat.It is looking so cute.I specially like its red colored spots all over its body. That is just what i want for my assignment!!!!! Would like to know more , and do something to HELP SAVE this cat . I can't say a lot in regards to this thought, yet it's really intriguing exchange surely. UK dissertation Writers appreciates the teachers. appreciate the teacher as they put their efforts to train students. UK dissertation Writers appreciates the teachers. Warid SMS Packages Daily, Weekly, Monthly 2018-19.Warid/Jazz has over 55 million subscribers in Pakistan. Warid’s merger with Jazz made it the leading telecom operator in the country. In this article, we will tell our readers about the Warid SMS Packages Daily, Weekly, Monthly 2018-19. Warid launched Smart SMS offer that enables the receiver to receiver your message even if the phone was turned off for a month. The moment the receiver turns on the phone he/she will receive the message.